Did you know that the sitcom Cheers maintained a spot in the Top 10 TV shows for eight of its eleven seasons? Or that it was the Number One series in its ninth season? Or that it was nearly canceled after the first season wound up second-from-the-bottom in the rankings? It also won a bunch of Emmys. The series deftly dealt with the death of a key character (Nicholas Colasanto) and the departure of one of the leads (Shelley Long). We’ve narrowed the list down to Cheers‘ ten finest moments. One of the running gags in this series were the battles with other local bars. In this episode, the nemesis is Gary’s Olde Time Tavern which the Cheers team beat in a bowling match two years earlier. When the trophy disappears, everyone knows Gary took it, so the Cheers crew retrieves it back, only to damage it. What ensues is a series of retributive pranks, ranging from sneezing powder in the air vent to phony exterminators creating a rat scare. 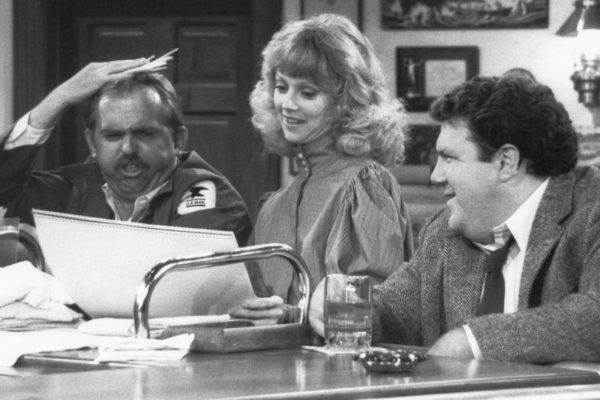 The ever-resourceful Carla (Rhea Perlman) gets the last laugh with some help from Cliff (John Ratzenberger) and Norm (George Wendt). The series finale ranks as one of the show’s best-ever, filled with bits for each cast member: Woody (Woody Harrelson) and Norm go into politics; Cliff gets a promotion at the post office; Rebecca (Kirstie Alley) marries her boyfriend at the Boston sewer department, and Sam (Ted Danson) and Diane, reunited at last, consider a lifetime together. The episode ends with Sam cleaning up the locked-up-for-the-night bar. Then a man knocks on the door. “Sorry, we’re closed,” he remarks. Fade to black. Diane’s old college friend (Julia Duffy) shows up after dumping her cheating boyfriend. Sam sees an opportunity to make a move, but Diane keeps getting in the way. Meanwhile, Norm attempts to impress his boss without seeming like a drunkard. This goal slowly changes once Norm’s boss’ capacity for alcohol is revealed. The central story concerns Coach’s daughter (Moonlighting’s Allyce Beasley) who’s engaged to an abusive fiancé because she believes he’s the best she can get. But daddy comes to the rescue as Coach reinforces just how wonderful she is. In an ingenious juxtaposition, a second storyline finds Diane attempting to be the bar’s “caricature artist” despite her terrible drawings looking nothing like their subjects. Some really clever writing helps keeps the mood of this one balanced between poignancy and parody. Cheers had many love twists for Sam and Diane, and this episode has one of the most delightful ones. When Diane moves in with Frasier Crane (Kelsey Grammer), she immediately starts having allergy issues. While Crane’s dog is initially blamed, Sam and Frasier eventually conclude that the reaction is rooted in Diane’s insecurities. Elsewhere, Carla is the recipient of a variety of gag birthday gifts that cause both laughter and embarrassment. The writing on this one is so good that it earned an Emmy nomination. The story centers around the return of Andy (Derek McGarth), an ex-con who’s one of Diane’s former blind dates. While his robbery is sabotaged by Sam, the real comedy comes from the side commentary from Cliff and Norm. As to the criminal, Sam agrees to let Diane rehabilitate him by casting him in a local production of Othello, in which she’s co-starring — to dramatic effect. Prior to Season 5, Long had announced her intention to leave the show and pursue a film career. But just in case she changed her mind, three endings were scripted and filmed for this season finale — including one in which Sam and Diane decide to get married. The ending that we ended up seeing has Diane learning from a former boyfriend (Michael McGuire) that her manuscript is attracting attention in LA. Like the actor who plays her, Diane leaves Cheers in search of a more glamorous opportunity. Bad move. Good episode. The relationship between Frasier and ex-wife Lilith Sternin (Bebe Neuwirth) is front and center here as Diane gives Lilith a makeover that results in a lot of sexual double entendres when the former couple appears together for a talk-show debate. A subplot involving a fishing trip taken by Woody, Cliff, and Norm highlights each of those characters’ essential traits. But really, this one is all about Frasier (and is likely one of the episodes that made clear that this character was worthy of a sitcom all his own). Another two-part season finale, this one deals with Woody’s planned wedding to Kelly Gaines (Kathy Swanson) which Carla astrologically predicts will end up a disaster. She’s right: Rebecca argues with the caterers and Cliff’s camera flash is so bright it constantly blinds everyone. Throughout, the aspiring newlyweds can’t stay away from each other even as they attempt to hide the nature of their premarital relationship from the bride’s father (Richard Doyle). Good luck with that! Emmy nominations for directing and editing didn’t pan out as awards. Guess it wasn’t in the stars. When a number of the Cheers regulars don’t have plans for Thanksgiving, Diane suggests that they get together at Carla’s for a potluck dinner before she ends up having other plans. Carla assigns what-to-bring to each guest— Cliff gets the turkey; Sam, the dessert — but a number of uninvited people also show up before the meal culminates with a food fight so involved that the cast actually shot it twice.